The agents at the IRS Regional Examination Center in Peoria, Illinois, appear ordinary enough to newly arrived trainee David Foster Wallace. But as he immerses himself in a routine so tedious and repetitive that employees receive boredom-survival training, he learns of the extraordinary variety of personalities drawn to this strange calling. And he has arrived at a moment when forces within the IRS are plotting to eliminate what little humanity and dignity the work still has. 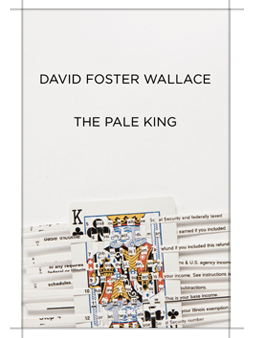 The Pale King remained unfinished at the time of David Foster Wallace's death, but it is a deeply compelling and satisfying novel, hilarious and fearless and as original as anything Wallace ever undertook. It grapples directly with ultimate questions—questions of life's meaning and of the value of work and society—through characters imagined with the interior force and generosity that were Wallace's unique gifts. Along the way it suggests a new idea of heroism and commands infinite respect for one of the most daring writers of our time. "A work that, as expected, only further proves David Foster Wallace's genius….The notion that this book is 'unfinished’ should not be given too much weight. It is in many ways, quite complete: its core characters are fully drawn, each with a defining tic, trait, or backstory…The experience to be had from reading THE PALE KING feels far more weighty and affecting than a nicely wrapped story. Its reach is broad, and its characters stay with you." "The Pale King is, for great swaths, an astonishment… Watching[Foster Wallace] loosed one last time upon the fields of language, we’re apt to feel the way he felt at the end of his celebrated essay on Federer at Wimbledon: called to attention, called out of ourselves. Jesus, just look at him out there." "The Pale King is, for an unfinished book, surprisingly wonderful and finished-seeming. Big chunks of it are full-on Infinite Jest-level great … Reading it is strangely intimate: you adore what’s good and (knowing that it might have been fixed) forgive what’s less good." 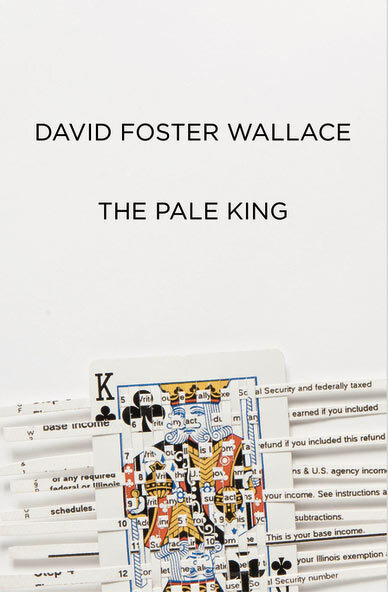 "Despite its shattered state and its unpromising subject matter, or possibly because of them, The Pale King represents Wallace's finest work as a novelist … The Pale King is imperfect, but it feels more like the work of a human being than Infinite Jest does." "Deeply sad, deeply philosophical…By turns breathtakingly brilliant and stupefying dull – funny, maddening and elegiac – The Pale King will be minutely examined by longtime fans for the reflexive light it sheds on Wallace's oeuvre and his life. But it may also snag the attention of newcomers, giving them a window…into this immensely gifted writer's vision of the human condition as lived out in the middle of America…his most emotionally immediate work…It was in trying to capture the hectic, chaotic reality—and the nuanced, conflicted, ever-mutating thoughts of his characters—that Wallace's synesthetic prose waxed so prolix, his sentences unspooling into tangled skeins of words, replete with qualifying phrases and garrulous footnotes…because in almost everything Wallace wrote, including The Pale King, he aimed to use words to lasso and somehow subdue the staggering, multifarious, cacophonous predicament that is modern American life." "The Pale King is different. Wallace left us this book—the people closest to him agree that he wanted us to see it. This is not, in other words, a classic case of the Posthumous Great Novel, where scholars have gone into an estate and unearthed a manuscript the author would probably never want read…To read The Pale King is in part to feel how much Wallace had changed as a writer, compressed and deepened himself…It's easy to make the book sound heavy, but it's often very funny, and not politely funny, either…Contains what's sure to be some of the finest fiction of the year." "The last work of fiction by the greatest American writer of my generation is an incomplete and weirdly fractured pseudo memoir about the United States tax code and several employees of the Internal Revenue Service… The Pale King, an unfinished manuscript that will be published this month by Little, Brown, is one of the saddest and most lovely books I've ever read." "[The Pale King is]… feverishly encompassing, sharply comedic, and haunting," and "a commanding and ingenious inquiry into monumental boredom, sorrow, the deception of appearances, and the redeeming if elusive truth that any endeavor, however tedious, however impossible, can become a conduit to enlightenment." "… one hell of a document and a valiant tribute to the late Wallace, being, as it is, a transfixing and hyper-literate descent into relentless, inescapable despair and soul-negating boredom."